As i mentioned in my previous, I've been taking a cake decorating class and we get to bake a cake every week for class. This decorating class is offered through Michael's and have 3 different courses. I finished my 1st one and am waiting to start the 2nd in a couple of weeks. So for our 3rd class, we had the option of making cupcakes and i decided on making red velvet cupcakes. Most people i know just love red velvet cupcakes and these came up moist and soft and airy which equals to PERFECT!! The rich red color with the chocolate flavor makes it great for any occasion. 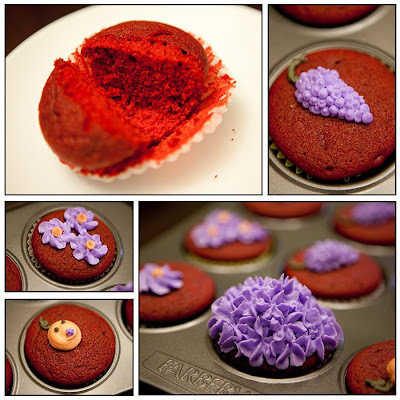 Red velvet cupcakes are usually either filled with or frosted and filled with cream cheese. The tartness of the cream cheese just goes so well with the sweetness of the cake. Here's the recipe. 4. In a small bowl, mix vinegar and baking soda. Yes, it will fizz! Add vinegar mixture to the cake batter and stir well to combine. Using an ice cream scoop, fill cupcake cups with cake batter (they should be 2/3 – 3/4 full). You may not fill all the cups, I ended up with 20 cupcakes. Place muffin tins on the middle rack of a preheated 350 degree oven. Bake for approximately 20-22 minutes, rotating pans halfway through. Cupcakes are done when a toothpick inserted in the center comes out clean. Check early and don’t over bake! 5. Cool the cupcakes in their tins on a wire rack for 10 minutes then remove and allow to cool completely before frosting. Frost cupcakes with cream cheese icing (recipe below) and decorate with red sprinkles if desired. The cupcakes above were decorated using the Wilton Cupcake Decorating Kit and Valentine’s Sprinkles. They can usually be found at craft stores like Michaels or Joann.